This is my fourth prototype of the Dejeweled physics engine. The engine still supports rod, pin, and door constraints, both rigid and springy, but this prototype only makes use of rods and pins. But there's a lot that you can do with rods and pins. 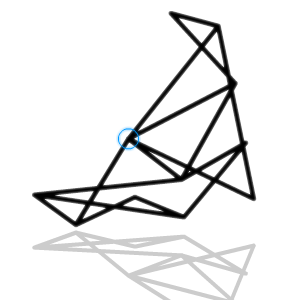 This is an experiment for an interface, to create interesting structures with the mouse. The final game might not use the same interface, but it will probably be similar. Click the window to start. Then click and drag the mouse to draw and move objects. You can create rods, pin rods to the background, move them, connect them, and delete them. To pause the simulation, hold down the space bar. Click the meters to adjust the physics settings. The "speed" setting will let you manually adjust the amount of slow motion. I've had to put this project on hold for a while, but now I'm back. I'm going indie, and Dejeweled is the big, ambitious project I'm working up to. You can expect to see a new update every week or so. I've been working on door constraints - angular constraints based on a dot product instead of an angle. The ragdoll has a staff. And a door constraint is what's keeping it from spinning around in the ragdoll's hands. It works pretty well. But what I really want is to make the staff rotate in a sort of bouncy, springy way. And I've been having a lot of trouble getting that to happen. It just spazzes out no matter what I try, which means that my math is wrong. This vector calculus has been kicking me in the head, repeatedly, for several hours straight.